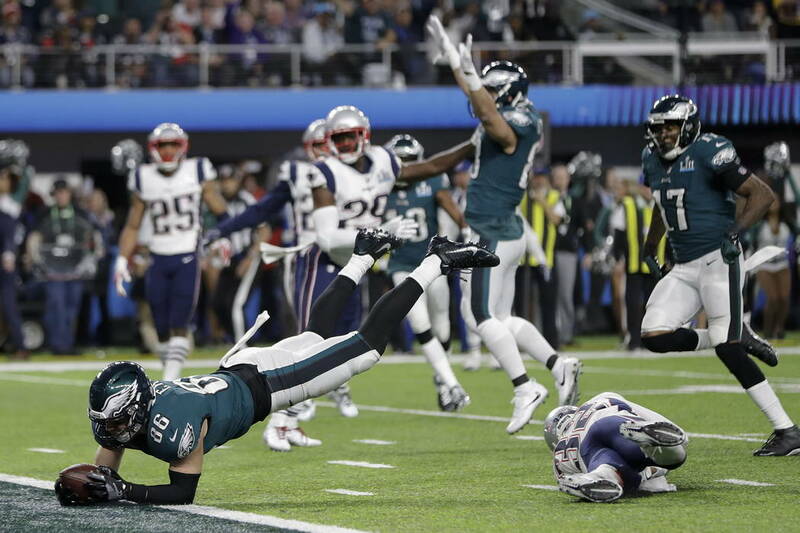 One of the most breathless bouts in 52 installments of the Super Bowl ended with the Philadelphia Eagles dethroning the New England Patriots 41-33 on Sunday. MINNEAPOLIS — The most breathless bout in 52 installments of the Super Bowl, a game whose frantic chase of NFL yardage records turned a Justin Timberlake halftime performance into a community choir recital by comparison, was down perhaps to its final round. Tom Brady strided onto the field. Two minutes and 21 seconds remained. He was 75 yards and six points short of a sixth career championship. What happened next, any Raiders fan can appreciate. A New England Patriots dynasty built on maybe the most controversial play in NFL postseason history — an apparent Brady fumble in the 2002 AFC Championship Game that was ruled an incompletion at the Raiders’ expense — took a fitting turn. Brady was strip-sacked early in the throwing motion. The Philadelphia Eagles recovered and ultimately rode to a thrilling 41-33 win. 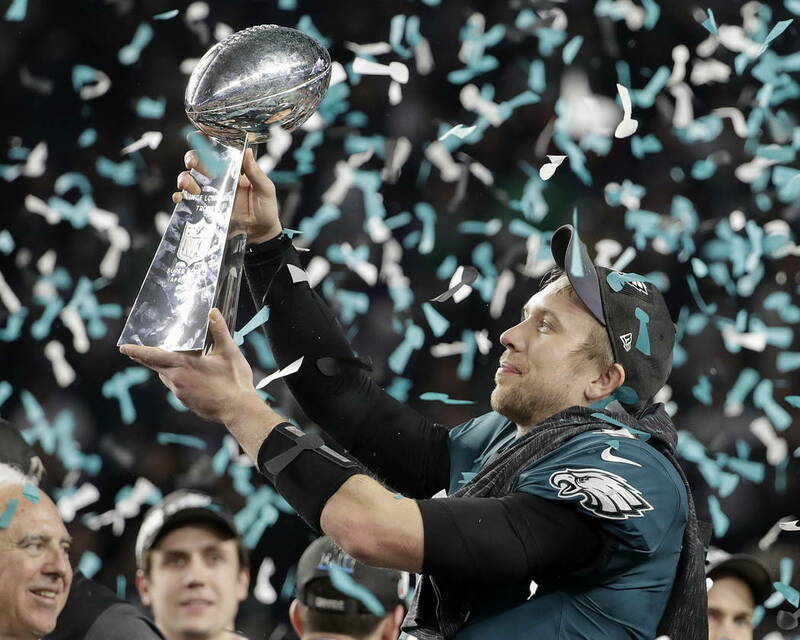 White and midnight green confetti snowed onto the turf at the indoor U.S. Bank Stadium, as the Eagles celebrated their first Vince Lombardi Trophy in franchise history. 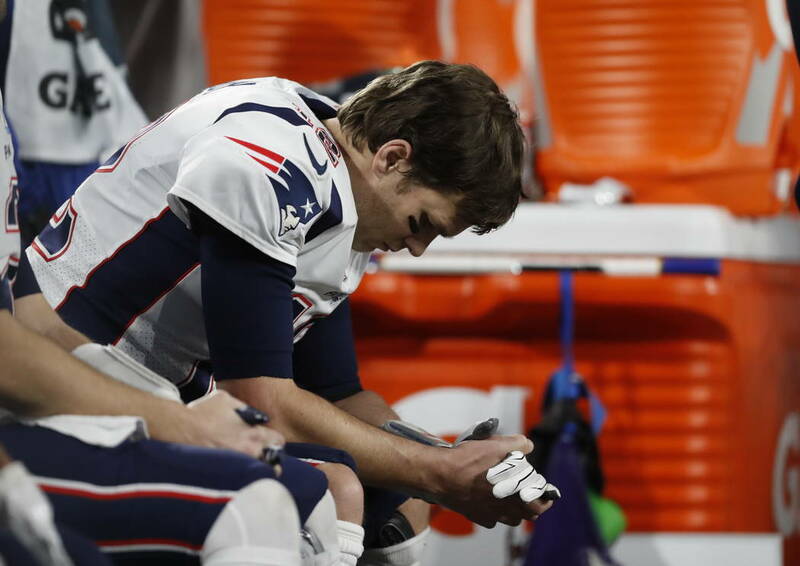 Until the non-Tuck Play, the Patriots were unrelenting. 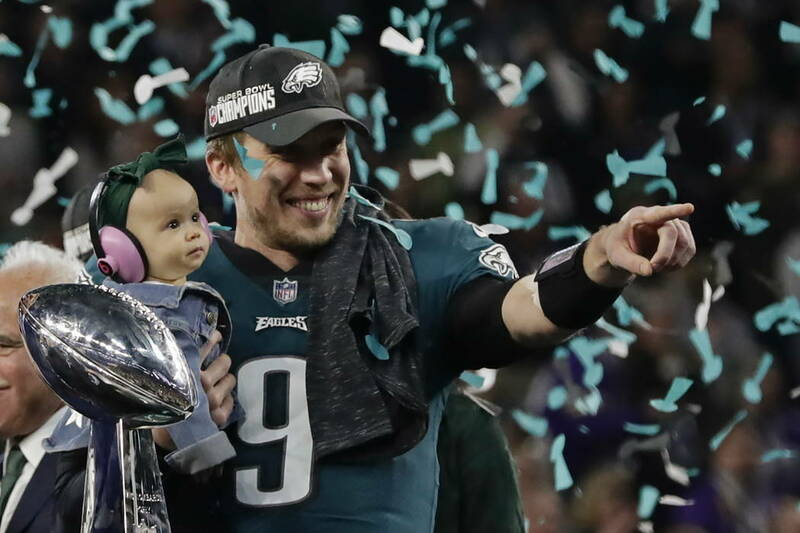 The Eagles, willed by Super Bowl MVP quarterback Nick Foles, crushed blows onto the defending champion’s chin only to have them returned like a “Rocky” movie. By the end of the third quarter, the teams combined for 962 yards of offense, already a Super Bowl record. They set an NFL postseason record with 1,151 yards by game’s end. Brady became the first player in NFL history — regular season or playoffs — to lose a game in which he recorded 500 yards passing with three touchdowns and no interceptions. 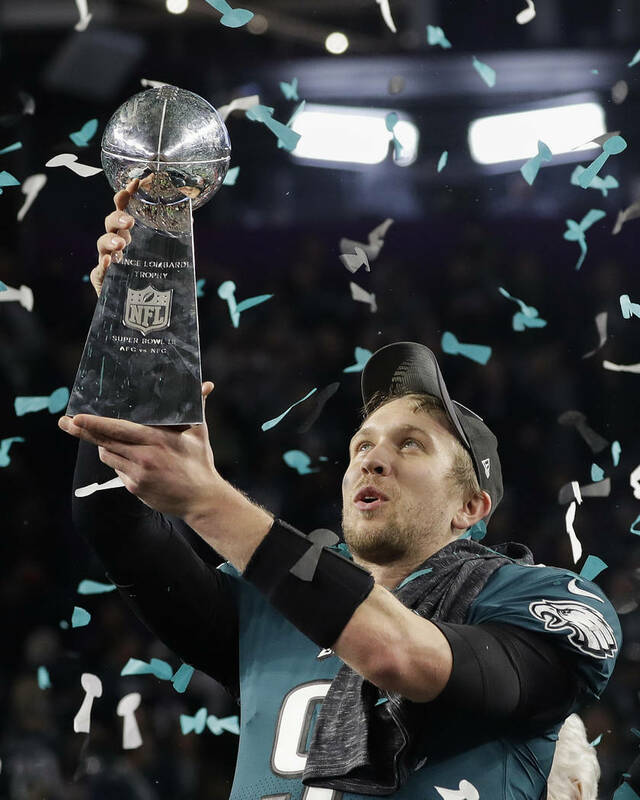 He totaled 505 yards, breaking the Super Bowl record of 466 he set one year earlier in a defying comeback from a 28-3 deficit over the Atlanta Falcons. For a moment, the stage for more magic was set. Again, New England trailed for the brunt of this one. Its first lead came when Brady found tight end Rob Gronkowski for a 4-yard touchdown, pushing the Patriots to a 33-32 advantage with 9 minutes, 22 seconds remaining. Foles responded with an 11-yard touchdown to tight end Zach Ertz. After a failed 2-point conversion, Brady took the field. He hit Gronkowski underneath for an 8-yard gain on the possession’s first play. On the second, Eagles defensive end Brandon Graham bull-rushed right guard Shaq Mason, ripped past his outside shoulder and then reached out with his left hand to smack the football from Brady’s grasp. Defensive end Derek Barnett recovered. There were 21 possessions throughout the game. Only one concluded with a punt. The back-and-forth slugfest carried across all 60 minutes, as the first and third quarters each produced three scores and the second and fourth quarters each featured four. The brawl was decided to the Eagles’ satisfaction.